Doctor Who: Ranking the Cybermen Stories | Warped Factor - Words in the Key of Geek. Dr. Moo begins to rank the Cybermen. 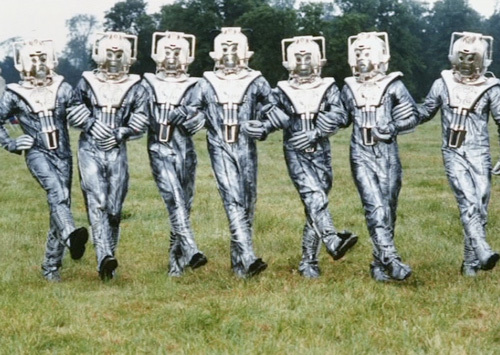 As the Cybermen mark their fiftieth anniversary, join me as I rank the fifteen TV stories they’ve been in so far from best to worst. Just for the fun of it. Silver Nemeshit is one of those stories that never really made the landing. There are some things here, like the Cybermen’s reaction to jazz, Ace’s nitro-9 and Lady Peinforte, but ultimately it never reaches its potential. The Queen certainly has no reason to be there, the Neo-Nazis don’t add anything and the Cybermen are defeated by gold coins and a slingshot. Such a shame that the official 25th Anniversary Story should’ve been so bad – especially since the exact same plot had been done so excellently with the Daleks earlier that exact same season! Does any other story so perfectly capture the essence of 80s Who better than this one? In that decade the series was capable of putting out some of its very best ever storylines as well as some of its very worst and there was no way of telling which extreme you’d get one week to the next. 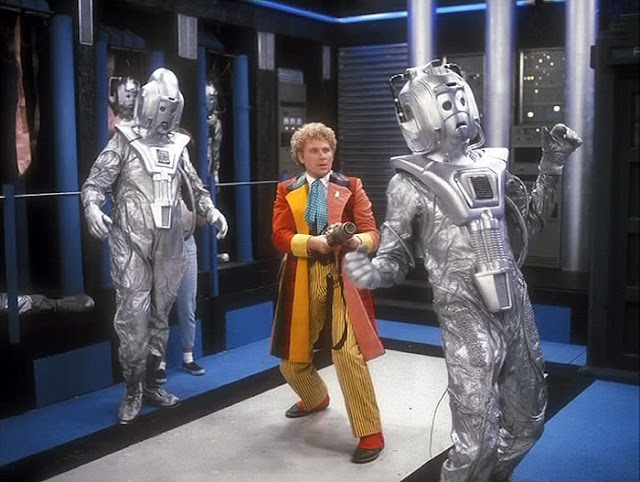 Attack Of The Cybermen manages to capture both of these things with the Doctor and Peri playing off each other better than normal but the extreme violence and OTT continuity references dragging it down. Also there’s the blasphemy of having the Chameleon Circuit fixed. I hate myself for putting an Eleventh Doctor story so low down on this list but I simply have no choice because Nightmare In Silver is rubbish. It’s a shame that should be the case since there are so many good ideas on display! The new Cybermen have super-speed, they have zappy space-guns, and they’re capable of such strength that to destroy them you have to literally blow up the entire planet! It also has Matt Smith as the villain, it has Clara leading an army, it has Warwick Davis as a Space Emperor and it has Neil “The Doctor’s Wife” Gaiman on writing duties. Why did such a strong premise go so wrong? We’ll probably never know, but I’m happy to point the blame at those two kids. Another disappointment, this story is a sequel to the flawless masterpiece that is The Ark In Space from earlier in the season – How could it not be good? Sadly it doesn’t live up to what came before and we get four episodes of pure filler before it finally limps to an end. 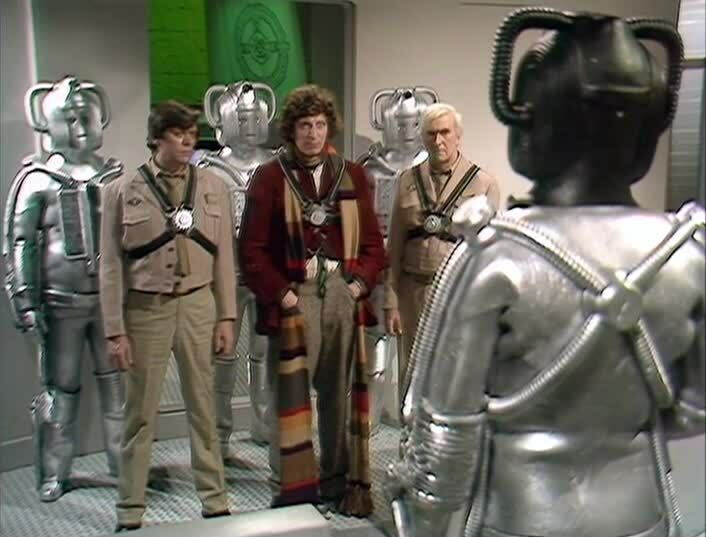 The pacing is poor, the dialogue is “off” and the Cybermen’s plan is questionable at best. It does at least have the TARDIS crew of 4, Sarah and Harry so it’s not a complete waste of time. Fulfilling what I can only assume was a childhood fantasy for them both, Russell T Davies and David Tennant treated the world to a battle royale between the Daleks and Cybermen. 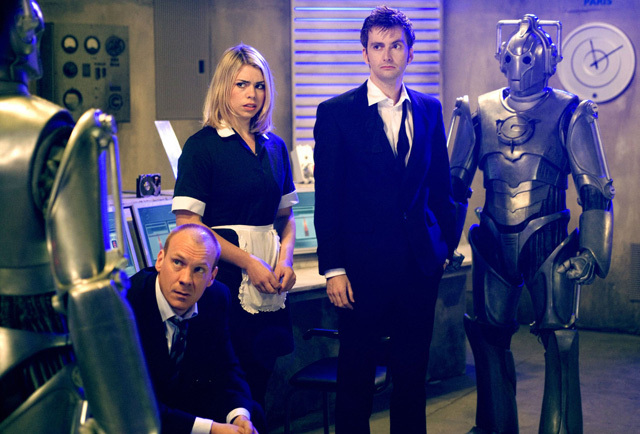 While the Cybermen are used effectively in the first episode as they hide as ghosts in plain sight and infiltrate Torchwood II from within, the story begins to derail in episode two once they’ve made their presence known and the Daleks show up. The trash-talking between the two monsters is insufferable, the parallel world stuff SCREAMS deus ex machina and the 10/Rose lovey-dovey stuff is where the focus goes instead – The Dalek Vs Cyberman premise that should be taking centre stage becomes a bit-part subplot on the side. At least by the end we’ve got Rose’s long overdue exit done and dusted… for two seasons anyway! 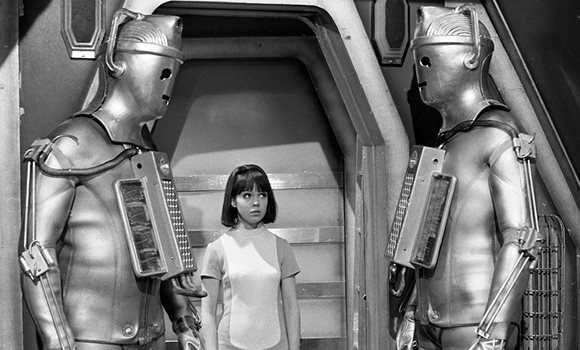 Again we have a Cyberman story that promised much but delivered little. I fully enjoyed The Lodger from 11’s first season so when we got a sequel to it the next year I was pleased. James Cordon’s Craig is the main focus of this story as we see 11 revisit him en-route to his death and realises that Craig’s homelife is a much greater adventure than anything that he could experience himself. The themes of loss and facing up to the inevitable are beautifully juxtaposed with themes of enjoying what time you have, and as Craig nearly runs out of his prematurely it’s ultimately his love and duties towards his son that save him and defeat the Cybermen. 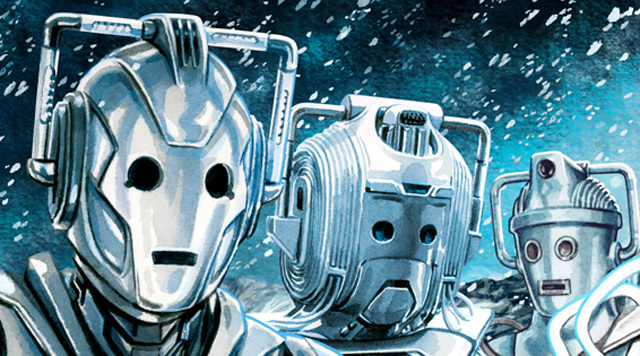 What holds it down so low on this list is that the tone can feel a little jarring occasionally but it’s still a good one, the first properly good story we’ve come across in this article so far, and a worthy inclusion on the Cybermen’s top ten. Unfortunately the majority of The Wheel in Space is missing, but luckily what remains of it is promising. From what we have to go on the story is very well made with the sets, costumes, effects and direction all seeming very good for the time. Zoe’s debut is a good one with lots of potential for her to become a fascinating character – and, unlike some, she lived up to it! What holds it down here is the fact that the plot itself is basically a rip-off of The Moonbase from not long before. As a fourth Cyberman story in a relatively short time there are diminishing returns beginning to set in, luckily the next one was The Invasion and … I’ll get to that later. 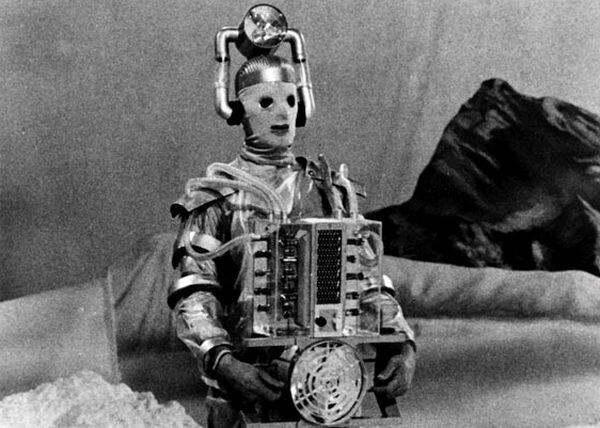 It’s easy to forget how revolutionary The Tenth Planet was upon first broadcast. The Cybermen make their first appearance here and look like a typical example of ultra-cheap monsters that 60s Who is infamous for – but as a result they’ve never been creepier. The sight of them marching through the snow is iconic and the tense atmosphere will keep you on the edge of your seat throughout. 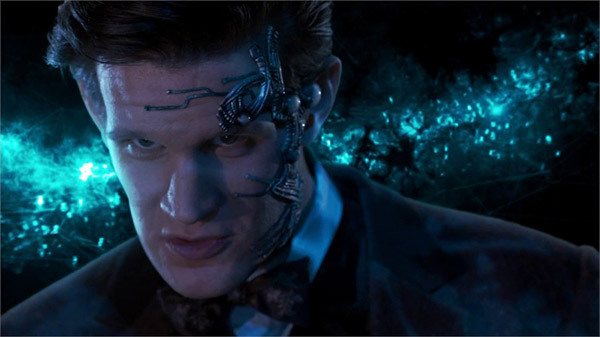 With their home planet in tow, the Cybermen are invading and the only man who can stop them has a body that’s on its last legs. By the end the Doctor has lost all his strength but still holds on just long enough to see off this threat before yielding up his body for that of Patrick Troughton. So long Hartnell, we’re gonna miss you! 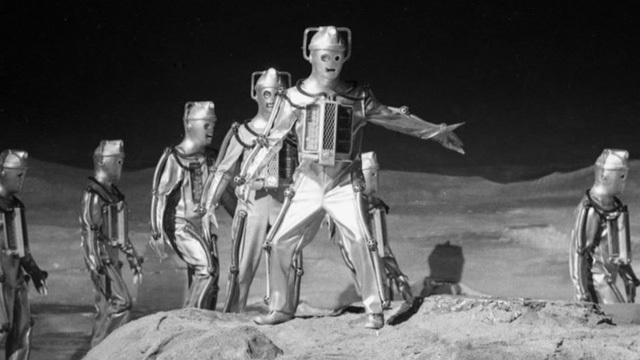 That difficult second Cyberman, The Moonbase ushers in a new look for them that’s more recognisable as the species as we know today, and their status as one of Doctor Who’s all-time greatest villains is truly established. The plot is best described as The Tenth Planet IN SPACE but adds in some new elements, such as taking over the base via infecting the food supply, and the tension is taken to a whole new level. Who can forget the sight of them walking slowly over the moon’s surface for one of the cliffhangers? It’s an underrated story that needs more appreciation from the show’s fanbase. 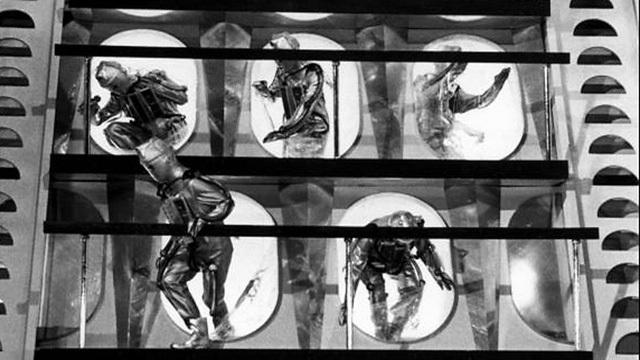 The most recent appearance of the Cybermen narrowly misses out on making the top five. 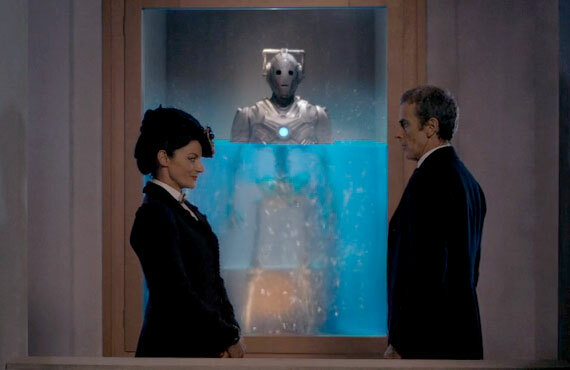 In his first season finale, the Twelfth Doctor encounters the Master for the first time only to learn that she’s regenerated into female form. Missy, as she insists on calling herself, is utterly bonkers and Michelle Gomez’s unhinged performance is a joy to watch as she commands the screen in a way that no Master since Delgado’s original ever has. Modern technology has reached a point that we can now see Cybermen taking flight and witness a global invasion that the Doctor is helpless to stop. Meanwhile the Doctor/Danny/Clara subplot comes to a satisfying conclusion as Danny sacrifices himself to save the woman he loves and, as collateral, he saves the world too before the Doctor and Clara tell lies to protect the others feelings. “Don’t cremate me” are the three words this story bangs on about but they’re not the three words its really about. 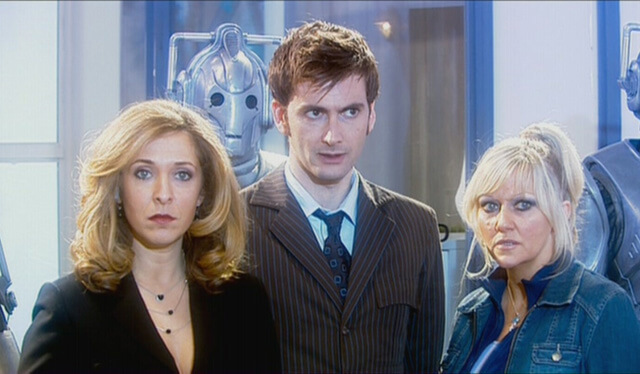 Making their debut for a new audience, the Cybermen returned with this 2006 two-parter. The story has the intriguing parallel universe aspect to it, allowing a greater scope for the narrative. 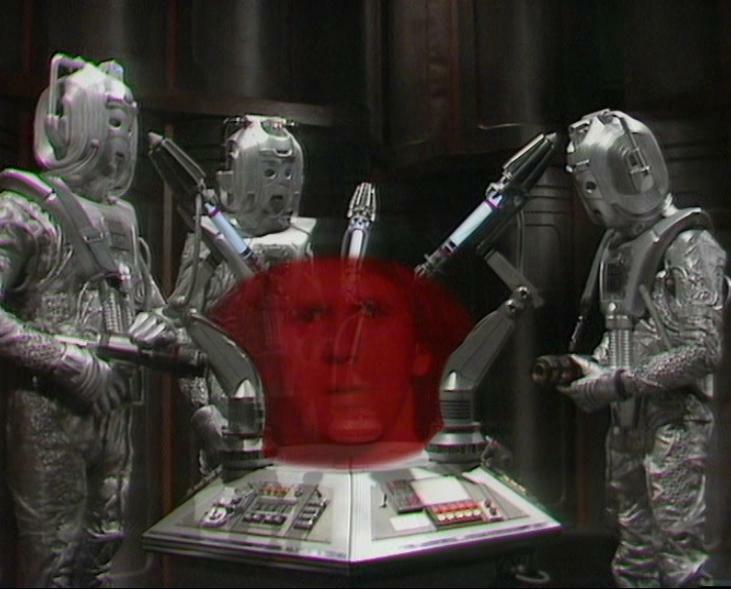 By the end the Cybermen have been neutralised in the UK but their threat remains internationally. The emphasis here is on the horror of the transformation process as giant saws and such come down from above as victims scream in terror. The parallel universe also allows for this to be driven home when we see characters we know getting the chop, as both Jackie Tyler and Mickey Rickey Smith receive death at their metallic hands. 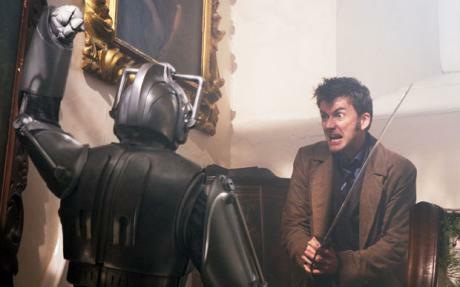 This is a strong story that proved that the Cybermen could still be a relevant threat in today’s world. The idea of Cybermen marching through the snowy Victorian graveyard and commanding the workhouses makes for some strong imagery that sticks in the minds of the audience but the true power of this story lies elsewhere. Jackson Lake is initially introduced as a future Doctor and the actual Doctor tags along with him assuming the companion role, allowing for an interesting new perspective on the Tenth Doctor. David Morrissey’s performance as Lake is a thoroughly engrossing one, and as the true horror of what happened to him and his family is slowly unveiled we sympathise with him and root for him. His storyline is the reason you come back to this. Sadly the Cybermen are somewhat left in the lurch by it, and the less said the better as far as the CyberKing is concerned, but this is still an episode that I can watch again and again, and I can’t say that about any of RTD’s other Christmas episodes. One of my guilty pleasures. This is the story with THAT image – you know the one! 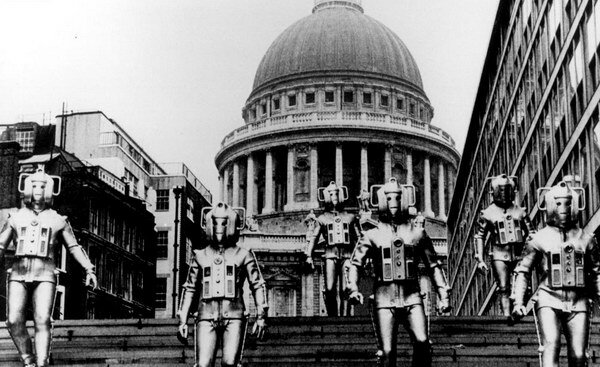 The sight of the Cybermen marching down the steps of St Paul’s Cathedral is so iconic that they tried to recreate in 2014. Even the casual viewers knew it was a reference. That’s how iconic it is. What makes it iconic is how terrifying it is, the sight of an unstoppable alien menace freely marching against the backdrop of cultural and religious significance as though they own the place, and it cuts right down to the heart of the audience watching at home. This is the story which set the template that the series still follows today whenever it does a big “Aliens Invading Earth” episode, and a big part of this lies in UNIT’s involvement for the first time. The only problem is how much The Invasion feels like a Pertwee adventure with Troughton shoved in instead, but by trialing that new template a year in advance the groundwork was set for The Pertwee Years – arguably the strongest run of stories that any of the classic Doctors got – while also telling a decent story in and of itself. What else could possibly have come top of this list but The Tomb of the Cybermen? Every single second is pure Whoiness from the word go. The first scene, for example, includes one of the best “Bigger On The Inside” moments there’s been and Victoria getting overwhelmed by it all comes back later for an emotional heart-to-hearts with the Doctor; from his age to his family we learn so much about him here and Patrick Troughton is never better. But the true appeal of this story is the Cybermen. The tension as our heroes explore their city, the edge-of-your-seat thrill of watching them emerge from the eponymous tombs (complete with that soundtrack) and the attack of the Cybermats against an unsuspecting Victoria, all of these moments capture why the Cybermen were, are and will always be one of the greatest villains of all time. 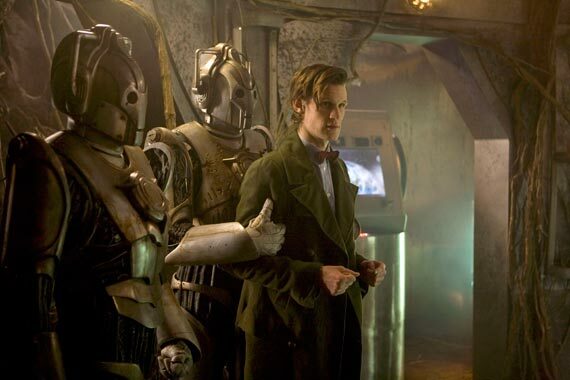 While it has its critics, personally I can’t recommend The Tomb of the Cybermen enough and, famously, neither can Matt Smith – How about that for an endorsement? So those are the fifteen Cyberman stories ranked from worst to best in my opinion. Agree, disagree? Tell me how you’d rank them!